Emoticons have become the universal language of the internet, with whole conversations carried out if only you use a little imagination. 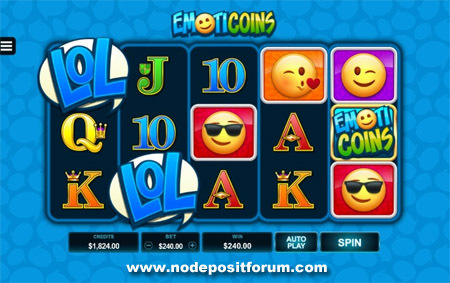 Microgaming has released Emoticoins and the fun begins the second you spin. This is a fun, bright, colorful casino game with music and sound that certainly make you happy. There is nothing overly difficult about the game play to be found in Emoticoins. Microgaming have made the game user friendly for players of all skill levels and experience to enjoy. EmotiCoins game is traditional with 5×3 reels and the tried and tested free spins, scatters and wilds symbols. Most players look for all of these features in a game they choose to play. Ace to 10 symbols will be filling the gaps between the smileys, with the other symbols being big smilies, such as sunglasses wearing, kiss blowing, smiling and naughty winking smiley faces. It is a simple layout, but you can’t help but smile while playing. After any random spin you can get up to 5 random wilds on screen. It actually happens more than you think; though mostly you only get 2 or 3 wilds and a small top up to your bankroll. Free spins with guaranteed 5 sticky wilds or the free spins come about every 50 to 100 spins or so, so more often than you’d think for a medium variance slot. The Emoticoins symbol acts as a wild icon in this game, and players can use it to substitute for all other symbols barring scatter icons. Wilds can form a part of a randomly triggered bonus in this game. On any spin at all, up to 5-reel positions can turn wild at any moment. When they do, players can expect to receive a considerable win. Players will also find a free spin bonus round in this slot. It is triggered by landing the LOL scatter symbols anywhere on the reels at least 3 times. In the bonus, players will receive a total of 10 free spins. Wild symbols can appear sticky on the reels on the first, third, fifth, seventh and ninth spins of the game. These sticky wilds remain in place for the duration of the bonus round. Microgaming wants you leave the EmotiCoins bonus happy, by giving you a sticky wild every other spin. What that means is that in 10 free spins, you’ll always get 5 sticky wilds by the end of the round. It’s not always a guaranteed large win, but generally at least over 20x your bet. Overall, it’s easy on the eye, fun, and not too harsh on the wallet. Players can actually win as much as 100x their total bet if they strike it lucky playing the Emoticoins slot bonus round. Emoticoins is a simple, fun and as expected, a possible cash cow when it comes to winning. Who said a game had to be complex for players to win big? Simple bonus rounds, wild symbols, and scatters are always a winning combination in a slot game. The win potential will have you coming back again and again. Online gamblers can play Emoticoins at Microgaming casinos such as Royal Vegas and Go Wild.